Home » 2013 Hilton HHonors Skate America » Ashley Wagner » Denney and Coughlin » Figure Skating Costumes » Ice Style » Mao Asada » Skate America » Skate America 2013 » Volosozhar and Trankov » ICE STYLE.....2013 Hilton HHonors Skate America: Ladies and Pairs! ICE STYLE.....2013 Hilton HHonors Skate America: Ladies and Pairs! The 2013 Hilton HHonors Skate America is an international figure skating competition and the first of six events in the 2013-2014 Grand Prix of Figure Skating, a series of senior level invitational competitions. This season is extremely important since it is THE Olympic season, so it's a chance to see who the possible contenders are for the Olympic Gold, Silver and Bronze at February's Sochi Olympics 2014. 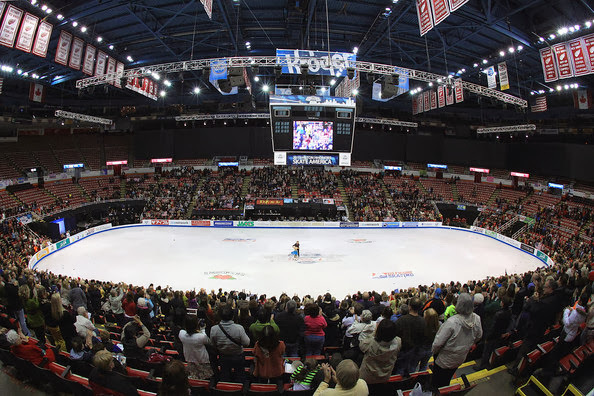 Skate America 2013 was held this past weekend at the Joe Louis Arena in Detroit Michigan. Now let's Discuss the Costumes. I've just picked out some--not all--from the Short and Free Programs costumes that I wanted to talk about so if I missed some, sorry :) This is a long season so I'm sure eventually I will discuss ALL! Ashley Wagner USA, Short Program: For her 2013-2014 Season Short Program, Ashley skated to "Shine On You Crazy Diamond" by Pink Floyd. She wore a black halter neck costume that featured silver crystal accents at the neckline, upper torso and waist. It was dark and "moody" yet still had enough "figure skating" sparkle to have an impact. Free Skate: For her Free Skate, she skated to Music from Romeo and Juliet by Sergei Prokofiev. 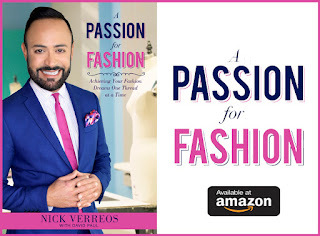 This time she wore an Empire-cut costume with a heavily jeweled bodice and softly-flaring skirt. I got the "Juliet" references and I did like the bright red color but I felt that the skirt section could have been more flared or possibly hi-lo or asymmetrical in style, to have more drama as she did her jumps and turns. It had a very Retro-vibe, but I wanted a bit of modernity added in. Both of her costumes were designed by Jan Longmire. Free Skate: Oh Elena!!! She skated to Music from the Frida soundtrack, from the Salma Hayek-starring film based on Frida Kahlo. The only think that even remotely says "Frida" is the red color, but everything else says Baton Twirler at a July 4th Parade. It's a lot of mess. Plain and simple. Viktoria Helgesson Sweden, Short Program: Sweden's Viktoria Helgesson skated her Short Program Mystery Waltz by D. Shostakovich. Her pink costume featured black sequined applique around the neckline and arms. The detail and color reminded me of a turn-of-the-century dress one would have seen at a Ball in France...or Saint Petersburg. I just wished her hair was a little more "done". Also, what do you guys think of the gloves? Yeay or Nay? I'm "on the fence". 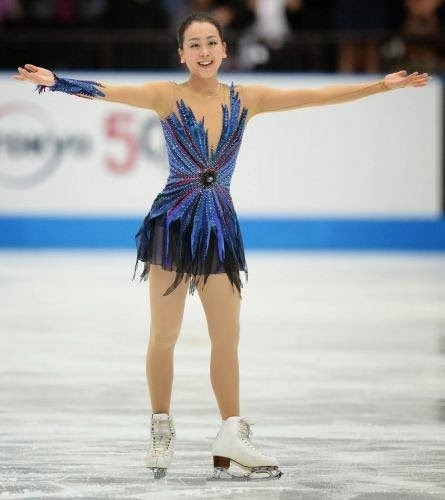 Mao Asada Japan, Short Program: Mao skated her Short Program to "Nocturne in E flat major, Op. 9, No. 2" by Frederic Chopin. Her costume was EXQUISITE. I loved the lilac color and ombre effect as well as all the delicate gathering at the upper torso. The four-layer skirt was perfect to highlight her turns and movements (this is what Ashley should have in her "Romeo and Juliet" costume) and her Triple Axle! And my favorite part was that back, I'm not sure if this was an overt homage to Paris (where the composer lived the last 19 years of his life, and died) but it sure did look like the Eiffel Tower. C'est Fantastique. 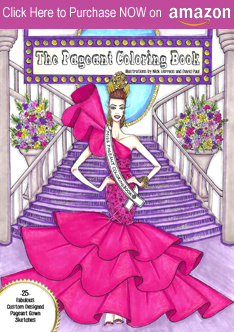 ...Asada wore a multicolored costume in royal, midnight blues, violets and fuchsia. The design itself was masterful and looked very expensive (nothing but the best for Mao!). It reminded me of an exotic bird taking flight. I also appreciated the 3D effect of the costume and how the "feathers" seem to be separated and jutting out from the illusion base of the costume. I know it's only the first Grand Prix but for now, it's one of my favorite costumes of Season 2013-2014. Margaret Purdy Michael Marinaro Canada Short Program: Purdy and Marinaro, who ended up in last place at Skate America 2013, skated their Short Program to "Unchained Melody" by Alex North. I added their SP costumes here as an example of something I don't like: when the man's costume has NO RELATION to the woman's. It's like the costume designer didn't have time to make him anything so they just looked in the "Figure Skating Closet" for something, anything. Their costumes don't make sense together. Tatiana Volosozhar and Maxim Trankov Russia, Short Program: Gold Medal winners Volosozhar and Trankov wore these costumes for their Short Program to "Masquerade Waltz" by Aram Khatchaturian. Now, these costumes are examples of a pair working together and being harmonious, costume-wise. Maxim is obviosuly the General with his army uniform featuring epaulets, gold buttons, red piping. And Tatiana is his love interest in this waltz, in a beautiful light lilac heavily embroidered and sequined costume hinting at the bodices of those late 1890s-early 1900s ball gowns. Very well done. Free Skate: For their Free Skate, they skated to Music from Jesus Christ Superstar by Andrew Lloyd Webber, as if you couldn't tell from their costumes. I love how the bright golden yellow color of his (very tight) pants are brought into the gold banding and straps of Tatiana's costume. His loose blouse also matches her costume. It's all a perfect pairing in costumes and right for the music. And it begs repeating: Maxim has got to be one of the SEXIEST men in Figure Skating. JEEEE---SUS is right! Stefania Berton and Ondrej Hotarek Italy, Short Program: Berton and Hotarek skated their Short Program to Music from the soundtrack of The Mask. 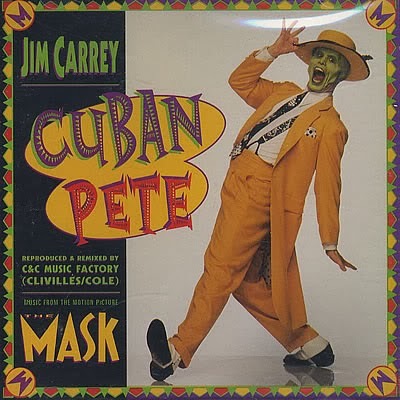 I wanted to show how great they played with Jim Carrey's original costume from the film (notice his suspenders and obviously, the bright yellow color). I also thought her dress was quite intricate and pretty. I really liked the gold overlay and mini-fringed hem. Caydee Denney and John Coughlin USA, Short Program: This American Pairs skated to "Tosca" by Giacomo Puccini. I liked these costumes better than their Free Skate and therefore that's why I wanted to add these. Her red gathered and crystal costume had interesting design details that under another costume designer's hand, could have ended up "Toddlers and Tiaras" but here it worked. I also loved John in his all black look with that PLUNGING neckline. His top, if you notice, featured a slight sprinkling of crystals to tie it in to Caydee's costume; he didn't need that much since hers already had soooo many. And notice the very delicate touch of red in his neckline. Good job kids! *NEXT UP: The Men's and Ice Dance Costume Highlights of 2013 Skate America!! Stay tuned!! 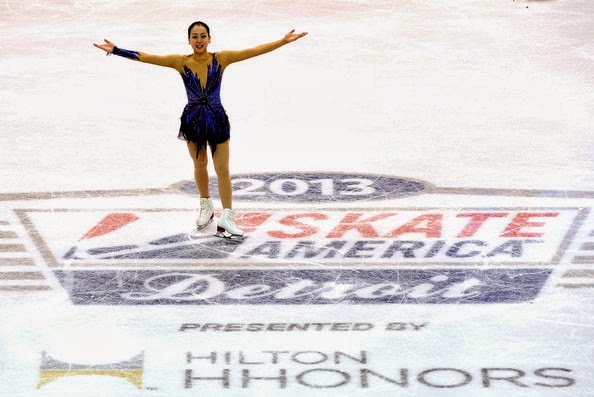 3 Responses to "ICE STYLE.....2013 Hilton HHonors Skate America: Ladies and Pairs! " Which one do you like best for Mao Asada's Nocturne SP: The original lilac or the CM only red version? Thanks for posting this Yammie. I like the lilac costume much better. I love the ombre dyed effect and the softer color on Mao. The red is beautiful too, but the lilac is my favorite!